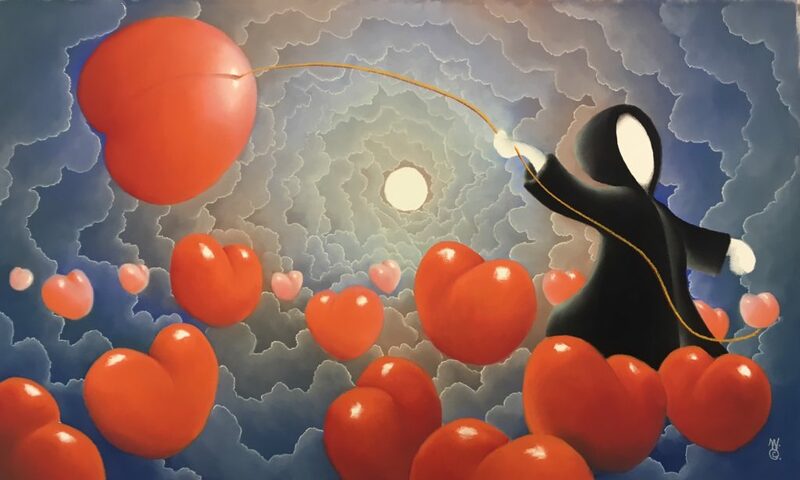 Mackenzie Thorpe began the celebrations for his 30th anniversary in style as he kicked off the first part of his 2019 world tour, with stops at Off The Wall Gallery in Houston, Texas and Onessimo Fine Art Gallery in Palm Beach Gardens, Florida. Mackenzie exhibited new and recent works from his best known collections. Included were some uplifting images feature cyclists in the Yorkshire countryside and classic pictures themed around love as the visit coincided with Valentine’s Day. The galleries held a number of meet and greets with Mackenzie who shared his story of triumph over adversity and talked to the crowds about the universal themes of love and hope which continue to inspire his art. Off The Wall Gallery presented the exhibition, Put A Little Love In Your Heart, which showcased a brand new bronze sculpture called Under the Tree of Love, while the Onessimo Fine Art Gallery staged, 30 Years of Love – referencing Mackenzie’s milestone year. “For me this year is a celebration; I can’t quite believe it’s 30 years, since I took a huge leap of faith and moved, from London with my family to a small market town in the UK and started trying to sell my work. In that moment I would never have thought that within a few years, I would be having exhibitions in the USA; as a child it seemed an unreachable dream that I would ever get to visit this amazing country.